The place many call “Jack’s House” has invited some of the world’s best golfers to its annual gathering, and it appears the party is going to spill into the weekend with a guest list unlike any other. The 41st playing of the Memorial Tournament presented by Nationwide at the Golden Bear’s Ohio home club of Muirfield Village Golf Club in Dublin is much like the 40 before it, in that it has again attracted one of the best fields in tournament golf. The Memorial has the top five players in the Official World Golf Ranking—with a roll call of No. 1 Jason Day, No. 2 Jordan Spieth, No. 3 Rory McIlroy, No. 4 Bubba Watson, and No. 5 Rickie Fowler. The field features six of the world’s top-10 players and 10 of the world’s top-20. Today’s play in the Memorial can be seen from 3:30 to 6:30 p.m. ET on Golf Channel. CBS picks up the weekend coverage, with the broadcast Saturday from 3:00 to 6:00 p.m. ET, and Sunday from 2:30 to 6:00 p.m. ET. Golf Channel will provide early weekend coverage, with golf on Saturday from 12:30 to 2:30 p.m. ET, and Sunday from noon to 2:00 p.m. ET. Jack will make appearances in the Golf Channel and CBS booths throughout the tournament, and is scheduled to go live Saturday on Golf Channel at 2:30 p.m. ET. 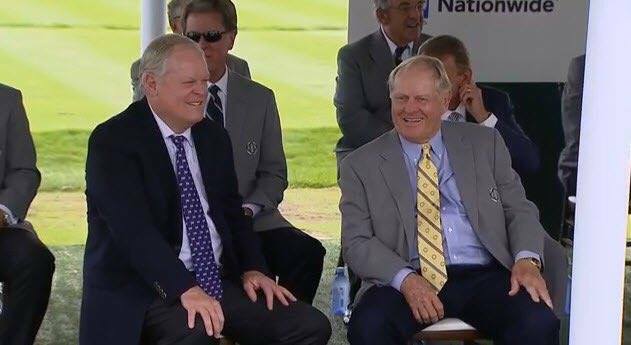 Memorial Tournament Chairman Jack Nicklaus II and Captains Club member Barbara Nicklaus will be interviewed live today at 3:15 p.m. ET by Golf Channel’s Steve Sands. The Memorial Tournament has been an elite tournament that has launched many a career, such as that of David Lingmerth. The Swede by way of the University of Arkansas is back to defend his break-through win on the PGA TOUR, when he beat 2010 Memorial winner Justin Rose in a playoff. After his victory in the Memorial, Lingmerth earned three top-10 finishes over his next five starts. During the 2015-16 season, Lingmerth has continued to play well. He is currently ranked 49th in FedExCup points and 48th in the world. Lingmerth takes on six past Memorial winners in this week’s field: K.J. Choi (2007), Ernie Els (2004), Jim Furyk (2002), Matt Kuchar (2013), Hideki Matsuyama (2014), and Carl Pettersson (2006). But for every golfer that has used the Memorial as a springboard to greatness, many others are looking for a Memorial victory to further validate already gaudy résumés. Fan favorite Phil Mickelson is making his 16th, and he has three top-10S—but no wins. That fact does not escape Mickelson. “I played here in 1986 in the U.S. Junior,” Mickelson reflected on Wednesday. “I always thought this was going to be a tournament and a course that I would play really well at, and I haven’t. But I keep coming back because I love it here. I love the course. I love the fact that it’s Jack’s event. I love the way the people are here, and I want to turn that around. I want to play well here. Memorial week is always a busy one for the Golden Bear, but it’s also much like a daily receiving line for Nicklaus, as players parade up to him—some in the middle of their round—remove their hat out of respect, shake his hand, and offer a heartfelt thanks. Nicklaus himself is a two-time winner of the event (1977, 1984) and the Golden Bear is also looking forward to a great week ahead. “Good shape” is one way to put it. Perhaps the crown jewel in Nicklaus’ sparkling design portfoli—which now features close to 300 of the 400 golf courses created by Nicklaus Design—Muirfield Village Golf Club has consistently been ranked one of the top-100 golf courses in the U.S. since it opened for play in 1974. Golf Digest recently named the layout to its 2016-17 list of the World’s 100 Greatest Golf Courses. Another feather in its illustrious cap: Muirfield Village is the only venue in the world to host all three of professional golf’s most prestigious international team competitions—the Ryder Cup (1987), Solheim Cup (1998) and The Presidents Cup (2013)—and the U.S. Amateur paid a visit to the Dublin, Ohio, layout in 1992. Muirfield Village Golf Club and the Memorial Tournament presented by Nationwide certainly bring some of the top golf stars in the world to Ohio—but another reason the tournament exists is to give back. Each year, proceeds from the Memorial Tournament are passed on to Central Ohio charities, principally Nationwide Children’s Hospital via the Nicklaus Children’s Health Care Foundation. The Memorial has contributed more than $26 million, with over $14 million through 2015 going to Nationwide Children’s. “Children’s Hospital saved my daughter Nan’s life when she was less than a year old,” Nicklaus said. “So Barbara and I have always said, if there’s one place we think we could help, we’d like that focus to be kids. So from day one, the Memorial Tournament has benefited Nationwide Children’s Hospital. Unique and successful relationships also exist with Fore Hope, The James Cancer Hospital and Solove Research Institute, Wolfe Associates, The First Tee of Central Ohio, Shriners, Lions Club and many other organizations. The tournament is also known for its support of servicemen and women. Wednesday at Muirfield Village Golf Club was Military Appreciation Day with complimentary tickets extended to active duty, military reserve, National Guard, military retirees, veterans and spouse military (including immediate family). Jack and Barbara Nicklaus hosted a special Military Appreciation Luncheon Wednesday to honor the nation’s heroes—who also helped get the tournament’s Wednesday Honoree Ceremony underway alongside The Ohio State University Marching Band. The tournament also paid tribute Memorial Journalism Award recipient John Garrity—the longtime Sports Illustrated writer—and posthumous Honorees Leo Diegel and Horton Smith. Diegel was a Ryder Cup pioneer, having played in the first four matches in the competition’s history. He also won two PGA Championships as part of 30 victories between 1920 and 1934. Smith was another tremendous Hall of Famer and deserving Honoree this year. He not only won two of the first three Masters (1934 and 1936), he had a remarkable start to his career. Much has been said about Jordan Spieth’s eight wins on Tour by the age of 23. Horton Smith won 14 times before the age of 23, including five tournaments in 1929—at the age of 21. To learn more about the Memorial Tournament presented by Nationwide, visit thememorialtournament.com or follow the Memorial on Facebook (facebook.com/thememorialtournament), Instagram and Twitter (@memorialgolf). Fans are invited to share their special moments using #MyMemorial. Jack Nicklaus is also sharing his behind the scenes #MyMemorial moments on social media at facebook.com/jacknicklaus and @jacknicklaus on Instagram and Twitter.